It’s Friday! Time for my blog feature, Building Character in which you get to meet a character from a book. Talking to a character outside of their book is fun! Huge. Amounts. Of fun. This week Strands of Thought is excited to host Hazel Nutt from the What Squirrels Do trilogy. It’s so great to have you with us, Hazel. Tell us a little about yourself. 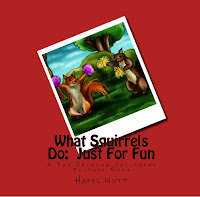 Hi, my name is Hazel Nutt and I am a toddler who is nutty about the outdoors and nature, especially squirrels. I like to chat to squirrels and they tell me their secrets. 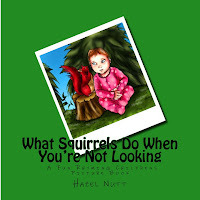 What the squirrels don't know is that with my parents' help, I have created 3 picture books exposing their best kept secrets! 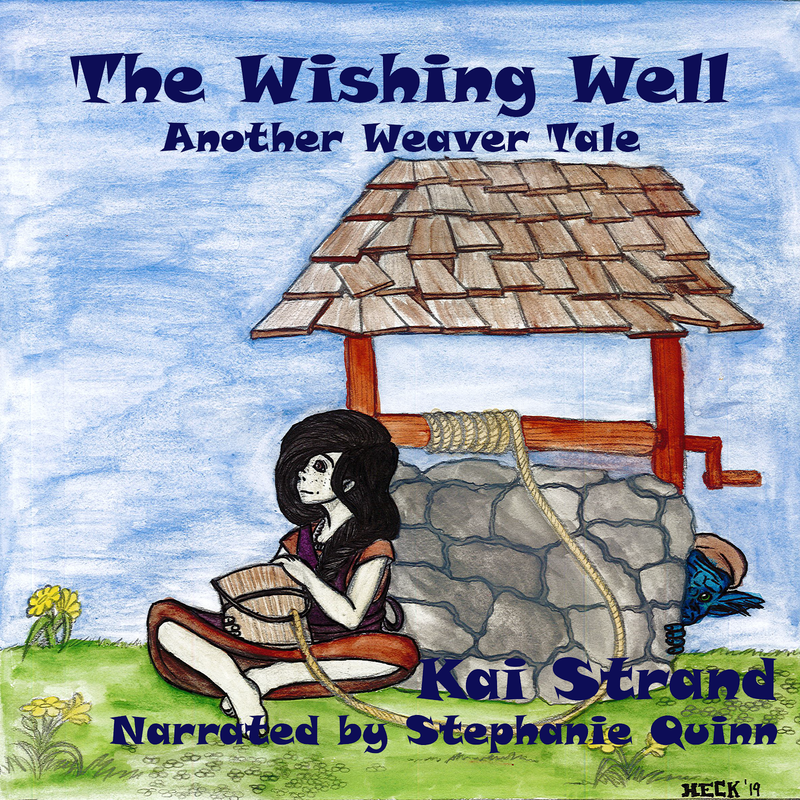 I am both the author and the narrator of these books and there is at least one picture of me in each of the books. I hope that my enthusiasm and love of nature is catching, and that I can encourage other young children to get nutty about nature as well. We’d love to learn more about you, Hazel. What would you say is your strongest personality trait? I am very persuasive. When I talk to squirrels I have to encourage them gently to tell me about their secrets. A lot of smiling, showing a lot of interest and being ever so complimentary does wonders. It also helps that I keep a supply of nuts and treats in my pocket! These curious creatures certainly can chatter, once they start they don't stop. What are your favorite leisure activities? 1: I love the outdoors, whether I am walking, running around, or in my buggy. I particularly like running around in the fields and walking through the woods. 2: I like to interact with nature, whether that be admiring the trees, chatting with squirrels, feeding the ducks, or scoping the woods for new animals to chat to! 3: I create blog posts describing how I see the world and I also tell other toddlers how to train their parents, to make life as fun as possible! My parents tell me that I can be anything that I want to be. So far I have considered being an acrobat, a ballerina, a clown, an explorer, a fashion designer, a jockey and a stunt person. I am already an artist and a writer, but what I'm really interested in at the moment is to be a conservationist like Jane Goodall. I really want to help animals and if I can make a career out of it, I will! If you could change one thing in this world, what would you change? I'd make sure that everyone respects trees as they are both beautiful and essential. The squirrels tell me that they don't just bury their acorns and nuts to find again later to eat, but they bury them so that other trees can grow and breathe life into our planet. Squirrels are great believers in the circle of life. What words of wisdom would you like to share with our readers? Don't take anything at face value! If squirrels can get up to all these shenanigans behind our backs, just think what the foxes, rabbits, or even our pets might do when we are not looking! Keep your eyes, ears and imaginations open and who knows what craziness might come to light. 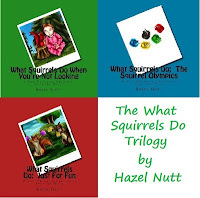 The What Squirrels Do is a trilogy of picture books that gives people an insight into these curious creatures, not EVER revealed to the public before. It will shock you to know some of the devious tricks squirrels play, it will solve some of life's mysteries, like why there are shopping trolleys in the middle of the woods, and they will make you laugh. These books cannot fail to bring a smile to the faces of both child and whoever is reading the book to them - Mummy, Daddy, brother, sister, grandparent or carer. Hazel Nutt is a baby who is nutty about nature, especially squirrels, whom she often has a good natter with. They tell her their secrets and her parents help her write them down to share with the world, as picture books. Loving nature is really important to her and Hazel Nutt hopes to make sure that lots of other kids get nutty about nature as well, starting with squirrels! Hi, Hazel. So nice to meet you. I love trees too. Being a conservationis is an awesome goal. As an animal lover I feed the birds and deer and try to help them however I can. Your books look lovely. I'm sure your readers enjoy learning more about you. Thanks for visiting Hazel today. Her enthusiasm is contagious, isn't it? Hi Beverly, thank you for your lovely comment :) Trees are amazing, I still today spend a lot of time in my buggy staring up at the branches of trees, its not just squirrels I appreciate, but the actual beauty of the tree itself. Kai, your questions are great fun to answer and make you think hard. 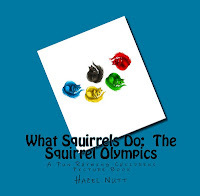 Also thank you so much for hosting me on my What Squirrels Do virtual book tour. 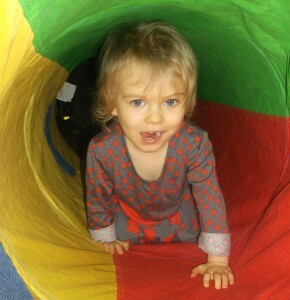 Hazel, it was great fun to meet you. I love your enthusiasm for the great outdoors. I'm sure it will last a lifetime.